In March 2015 David Walker at Anderson Moores Veterinary Specialists published peer reviewed research in Veterinary Record. Interesting new report on high numbers of RNA viruses in fish, amphibs & reptiles. As RNA viruses can cause acute renal failure, is one of these viruses the possible cause? Dr Fiona MacDonald’s recent research shows possible links to a bacteria: Aeromonas hydrophila. Wondering why so little cases of Alabama Rot in scotland and North Wales both high rainfall areas. Also Farm dogs.Both muddy and wet. 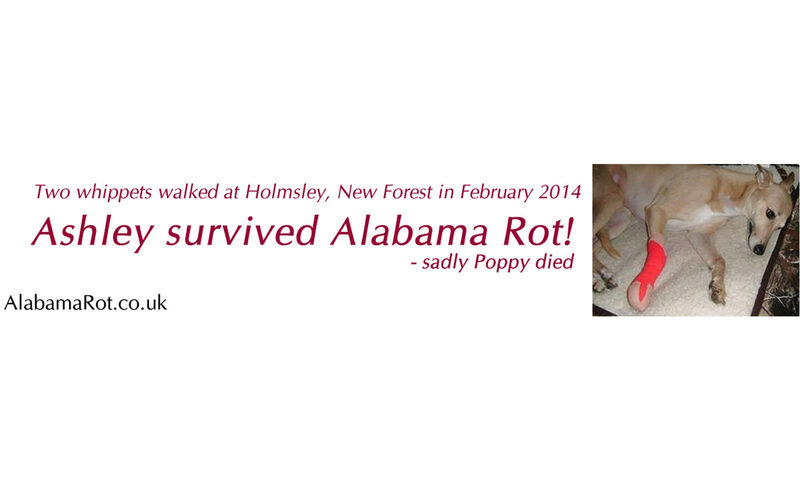 Alabama rot reaserch links mud/ water as a suggestion of areas to be careful. 2) Has there been any cases in farm dogs – always in Mud and staggnet water. Due to the apparent increase in cases of Alabama rot during the autumn and winter, the possible link to something found in fish and the fact that affected dogs appear to have walked in wet muddy areas in relatively close proximity to water sources; has any research been done into a possible link with migratory water birds that spend the winter in the uk? I live in Claverdon Warwickshire,which has had a case of Alabama rot.I have recently noticed with the wetter weather ,strange slime/spores in grass, both around my fields and around Claverdon.On googling images I found that it is called slime mold which grows in wetter weatger conditions .I just wondered if this had ever been looked into as a possibleblink with Alabama rot? Frances, thanks for your reply. Does anyone know whether ‘slime mould’ has been studied? I’ve not read any reports that this could affect dogs kidneys.